The Emory women's team claimed its eighth consecutive NCAA Division III championship as the men's team won its first NCAA title in school history. Emory women’s and men's Swimming & Diving teams swept the 2016-17 Division III National Championship, held March 15-18 in Shenandoah, Texas. The women’s team continued its dynasty by clinching its eighth consecutive NCAA national championship and the 10th overall in program history. The men’s team also secured the Division III championship, its first ever after previously finishing in the top-three at nationals 13 times, including second-place finishes in 2001, 2004, 2005 and 2009. The men’s team shattered the reign Kenyon College and Denison University held over the NCAA Division III men's competition for almost four decades, as no other program other than Kenyon or Denison had won the team title since 1979. Throughout the championship meet, members of Emory's women's team earned a total of nine event national titles, including a sweep of all five relay events for the second consecutive year. 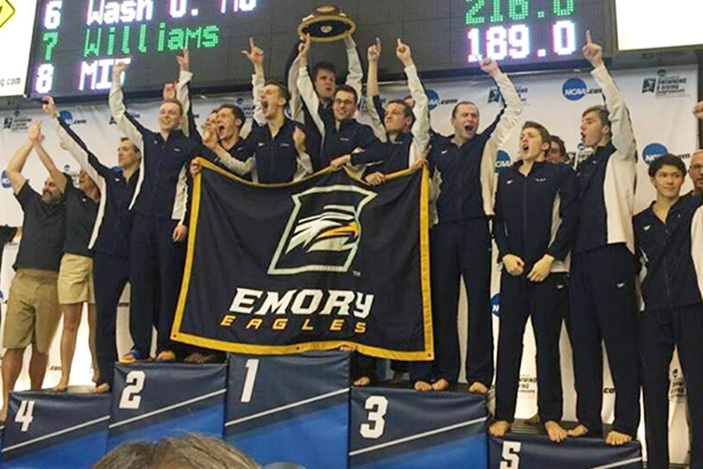 Emory set four new Division III records across the four days of competition, collecting 28 All-America finishes — 23 individual and five relays — and added 15 Honorable Mention All-America certificates. The women’s team finished with 645.5 team points, more than 200 points ahead of second place Williams College at 445. The Eagles won national championships in the first two events. Sophomore Julia Durmer claimed the 1,650 freestyle crown, with a school record time of 16:27.82, more than 12 seconds faster than the second-place finisher. Classmate Fiona Muir followed by winning the 100 freestyle, also setting a school record at 49.28. The 400 freestyle relay team featuring Muir, seniors Marcela Sanchez-Aizcorbe and Marissa Bergh, and freshman Caroline Olson posted a time of 3:19.56 in the championship final to win the event, setting a new Division III record. Adding All-America honors for Emory on Saturday were Bergh (5th, 50.60) and Sanchez-Aizcorbe (6th, 50.77) in the 100 freestyle; junior Cindy Cheng in the 200 backstroke (3rd, 1:58.62); and senior Annelise Kowalsky (4th, 2:15.63) and sophomore Ashley Daniels (6th, 2:17.50) in the 200 breaststroke. Five swimmers collected Honorable Mention All-America honors Saturday night: Junior Ming Ong in the 1,650 freestyle (11th, 17:06.48); Olson (11th, 50.77) in the 100 freestyle; junior Sia Beasley in the 200 backstroke (15th, 2:03.24); and sophomore Hannah Lally (10th, 2:18.16) and junior Megan Campbell (15th, 2:20.87) in the 200 breaststroke. 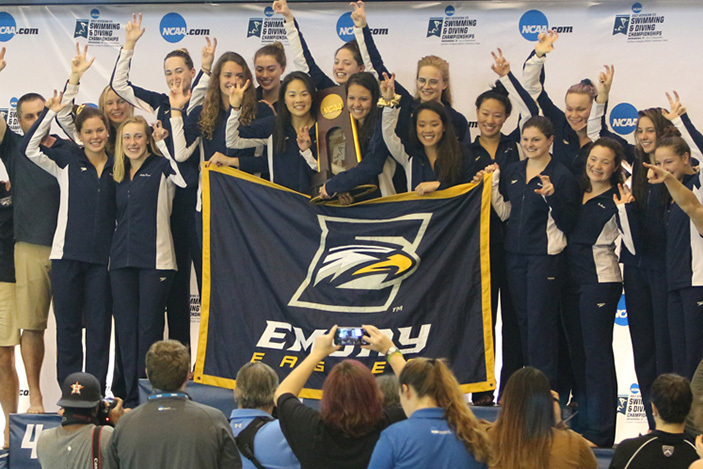 The Eagles, having never won more than three event titles in a single championship meet, recorded eight total over the four-day meet as they moved toward the national championship. Emory's men's team finished with 438 points, 54 more than second place Kenyon College. Denison rounded out the top three with 371 total points. In addition to the eight event national titles (four individual, four relay), Emory set five Division III records, saw 16 All-America finishes and had four Honorable Mention All-America finishes. Senior Andrew Wilson was named the Swimmer of the Year for the second time in his career after an impeccable performance at the meet. Wilson won three individual titles in the 200 IM, 100 breaststroke and 200 breaststroke and assisted on a pair of wins in the 200 and 400 medley relays — all five wins setting new Division III records. On Saturday, Wilson closed out his remarkable Emory swimming career, finishing the 200 breaststroke in dominant fashion at 1:50.80 and winning the event by almost eight seconds. Following Wilson's win in the 200 breaststroke, the 400 freestyle relay team of sophomore Trey Kolleck, juniors Alexander Hardwick and Oliver Smith, and senior Hayes Burdette-Sapp clinched the win for the Eagles. The group defended their 400 freestyle relay title, breaking the school record with a time of 2:56.68. Smith added All-America honors for Emory in the 100 freestyle, finishing third overall. During preliminaries, he broke his previous school record, at 43.54. Sophomore Matt Rogers finished fifth overall in the 200 backstroke. Junior Henry Copses, Kolleck and freshman Sage Ono added Honorable Mention All-America performances on the final day of action. Copses was 14th in the 1650 freestyle (15:46.31), Kolleck was 16th overall in the 100 freestyle while Ono was 14th in the 200 backstroke. Head Coach Jon Howell was named the Collegiate Swimmers Coaches Association of America (CSCAA) Women's Swimming Coach of the Year after the meet for the sixth time in his career and the second consecutive year. Howell was also named the CSCAA Men's Coach of the Year. Men's Swimming & Diving won its first NCAA title in 2017.